Your Alarm.com powered system will seamlessly connect all the key devices in your home providing you with smart, responsive and intelligent automation. Enjoy advanced control, better awareness, and the most reliable state-of-the-art technology today! The user-friendly mobile app enables your devices to all talk to each other, securely. Home automation is controlling your entire home, including lighting, audio, window treatments, and even heating and cooling, all in one spot. Your beautifully integrated control panels put all of your home’s functions at your fingertips. Keep your home's appearance as streamlined and seamless as possible with home automation. 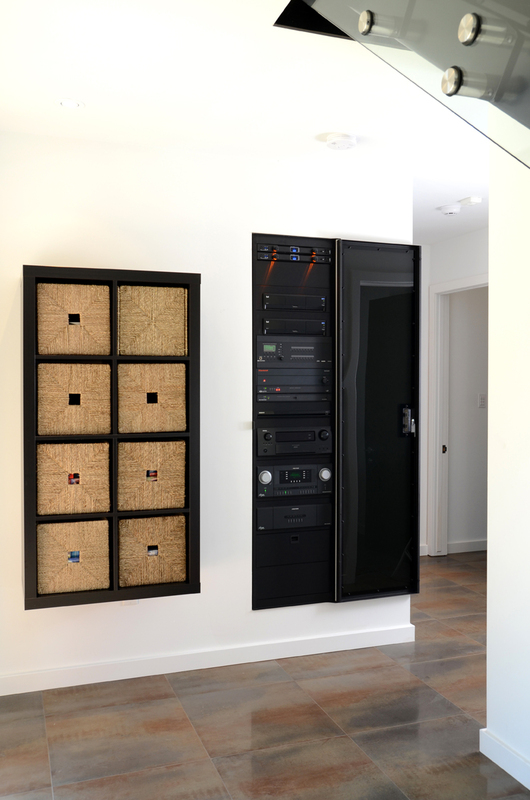 No need to have boxes of electronics by every TV and light switches and dimmers on every wall, we can centralize all these boxes and switches, for an easy to use, clean looking home. While building or renovating, you owe it to yourself to visit our showroom to see what opportunities are available for your new home. For the finest in ambiance, convenience, security, and efficiency. You’ve crafted the space of your dreams, from flooring to furnishings. A lighting control solution further enhances your design by eliminating unsightly banks of switches, and giving you the perfect quantity of light for any situation from a dinner party to preparing a meal. Imagine being able to control any light in your home, from any device in your home from your TV remote, in-wall touchscreen, or iPad. With one touch on your keypad, you can turn every interior and exterior light on for peace of mind security. With one touch on your TV remote, you can gradually dim your media room to create a dramatic environment. Or with one touch on your way out the door ensures everything is turned off for the highest efficiency. With a simple touch of your music button turns your everyday routines into something enjoyable. Music control can be integrated into your music streaming services along with your locally stored music files so they can be enjoyed throughout the home. You’ll enjoy all of the best parts of a movie theatre experience from great surround sound and an incredible wide screen picture. You’ll also love that your favourite seat is always available and it’s all within the comfort of your own home. Call us today to schedule an appointment here at our showroom! Control the light both inside and out. Learn how Hunter Douglas window shades can enhance the beauty of light entering your home. Looking for motorized shades? We are the experts! Looking for drapery options? We have a full line to choose from. We look forward to beautifying your home with you! Call us today to schedule a visit to our showroom. Bring everything you expect from your indoor entertainment, outdoors. 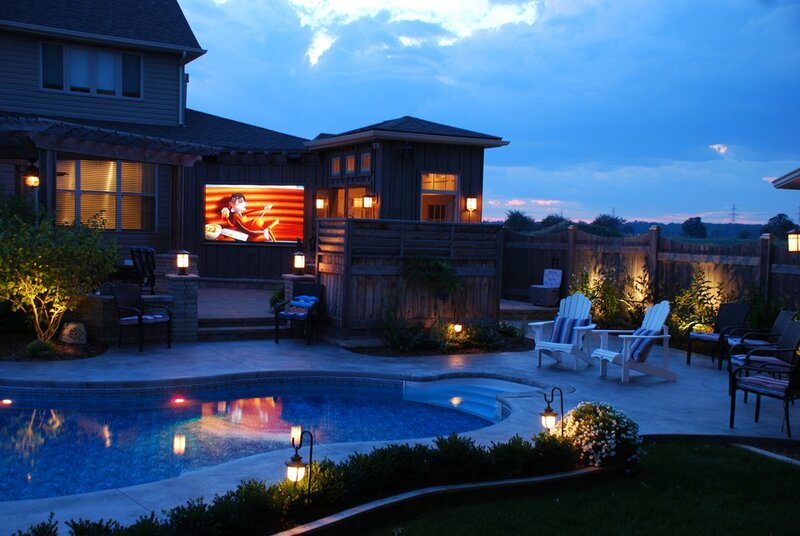 From rich, full sound that disappears into your landscaping, to larger than life video under the stars. When working with Dell Smart Home Solutions for you’re outdoor space... the sky’s the limit. View our Outdoor Entertaining Video to learn more! Virtually every device we touch, also touches the Internet. A strong, enterprise grade network keeps gridlock off your information superhighway. Let’s wire your home for a durable, dependable solution. We have many solutions to reduce the amount of “dirty energy” roaming around your home, ask us how! Being green shouldn’t make you feel blue. With an automated home, one simple touch can give you the most comfortable, entertaining, inviting, and efficient home. Now there are no compromises. Green and sustainability efforts are much more complex than just harvesting daylight and dimming lighting levels. Managing and controlling ambient lighting is only one small piece of the puzzle. Meaningful reductions in energy usage and utility costs can only be achieved by integrating all your home’s systems on a single, intelligent management platform. Disclaimer: Dell Smart Home Solutions Inc. is in no way connected with, sponsored by or licensed by Dell, Inc.